Landing number 2085; A Landing A Day blog post number 513. 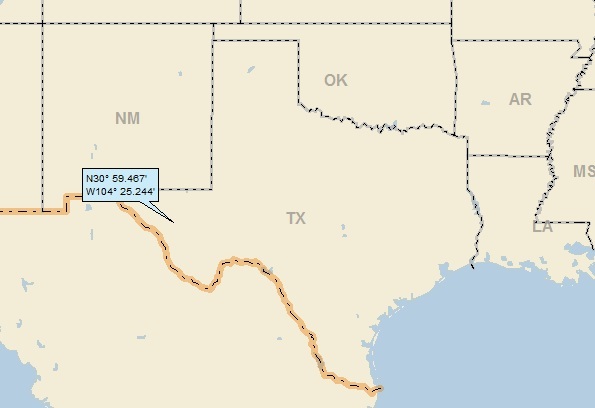 Dan – When I saw my random lat/long, I thought that maybe I landed in north Texas. 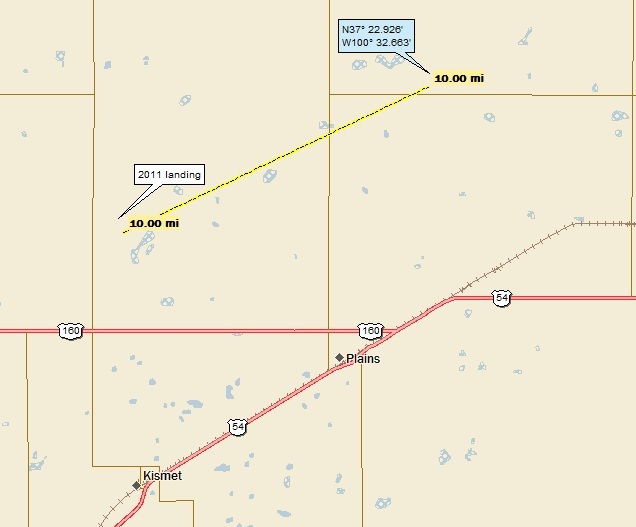 No such luck, as I landed north of Texas and north of the Oklahoma panhandle and into the southwest corner of this OSer . . . KS; 61/56; 2/10; 150.2. Note that I’m back in the 150s . . . 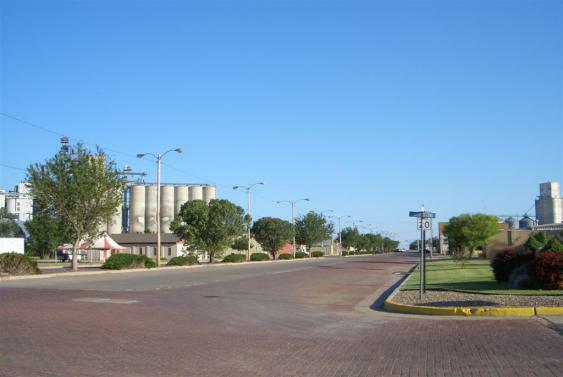 Remember my Hugoton post? The one about the crazy County Seat War? No surprises here (and no StreetView coverage, either); although I think the scenery is pretty consistent over a very large area. 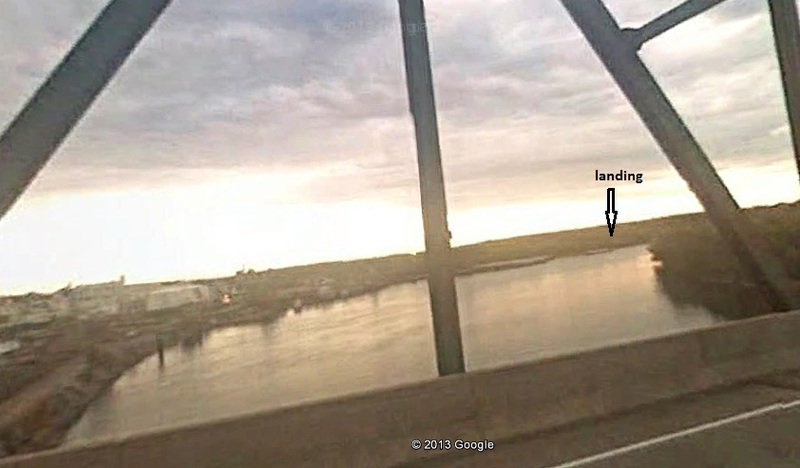 Thinking that, I went south of my landing to Route 54, and took a look at the StreetView shot. I happened to notice that a pick-up truck was passing the Google StreetView camera car. 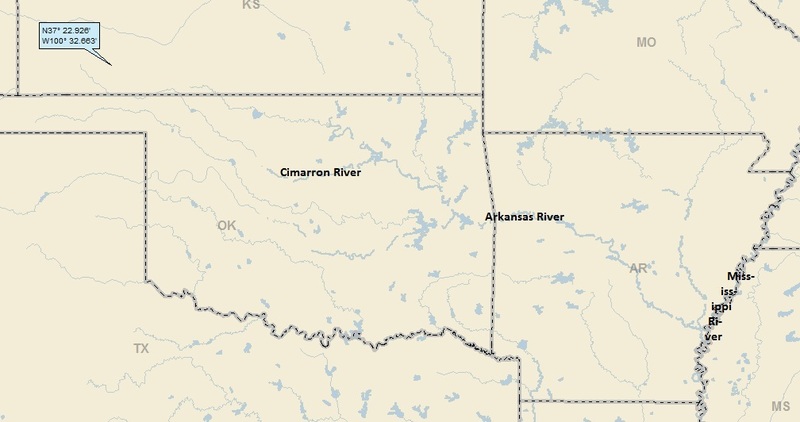 As you can see, I’m in the Cimarron River watershed (15th hit); on the Arkansas (113th hit); on to the MM (819th hit). 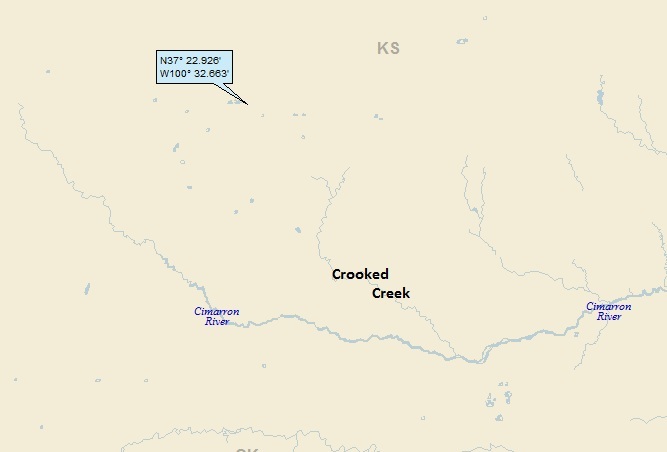 By the way, this was my 11th “Crooked Creek” watershed in which I have landed. Anyway, like I said before, it’s time to get back to Plains (which seemed familiar). 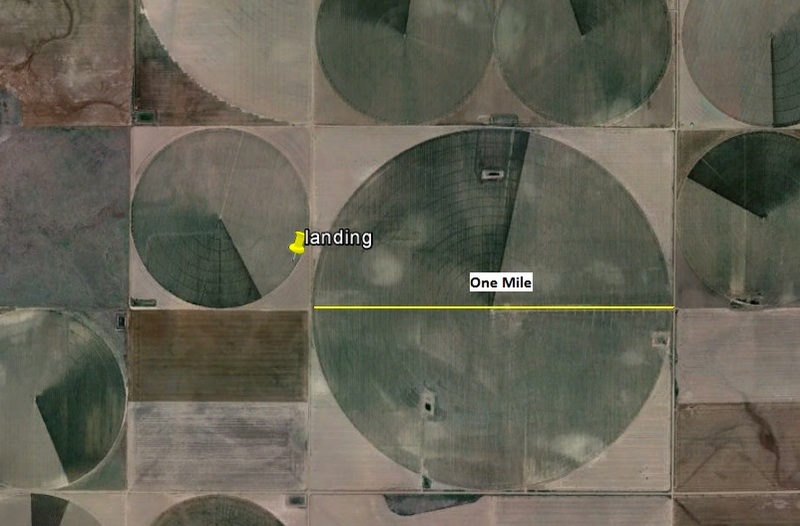 So familiar, in fact, that I was pretty sure I landed near hear and did a post about Plains. 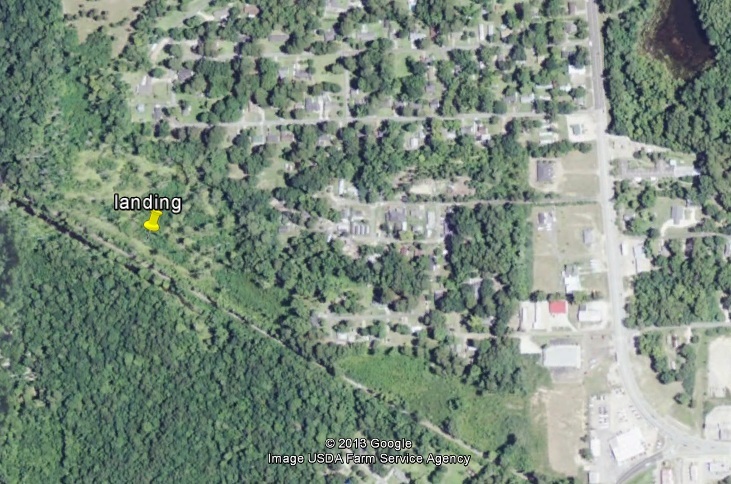 My first choice in this situation was to find a hook associated with one of the other small towns in the area. Much Google time spent, no results. 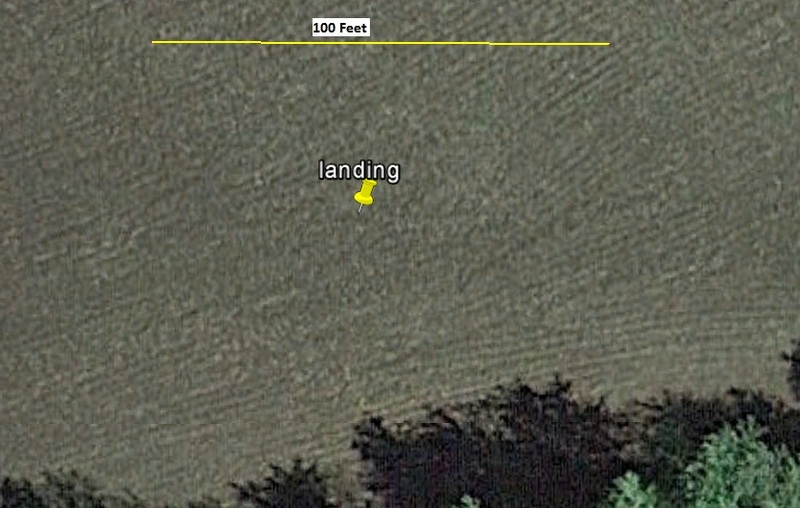 Combine this with the fact that I was in the very same area just 12 landings ago, and I decided that I would more-or-less repeat a good chunk of my March 2011 post. Here goes . . . Landing number 2084; A Landing A Day blog post number 512. I’ll be closing this post with some photos from this high country, but first, what about my watershed? 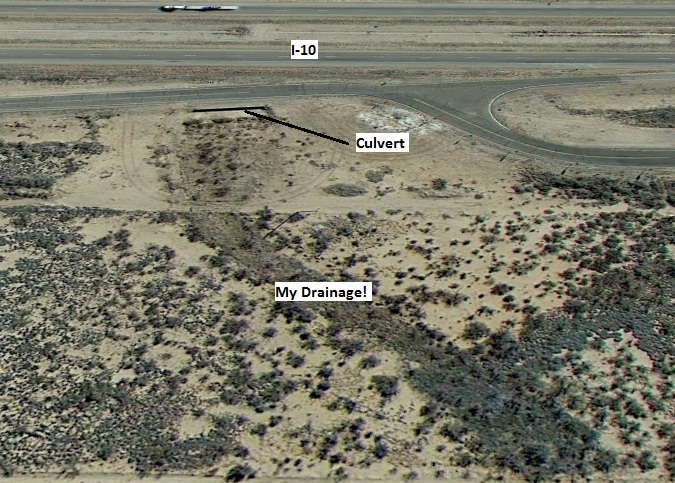 That’s quite the culvert, undoubtedly designed for a nasty cloudburst that results in a flash flood. 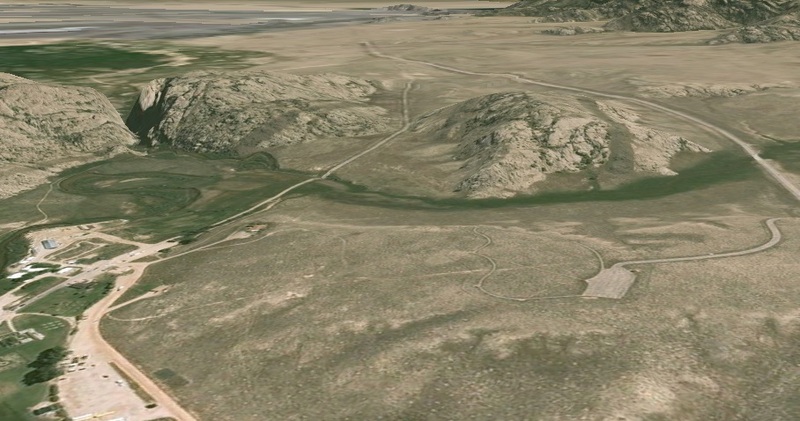 A north-south road (US 54) runs about a mile west of the playa. 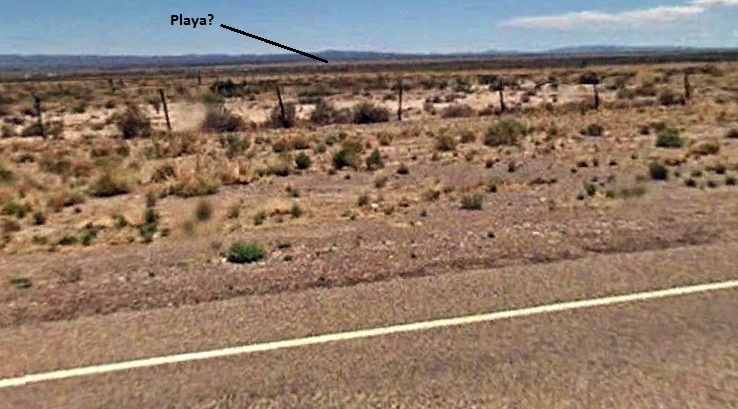 Here’s a StreetView shot looking east from the road towards the playa. 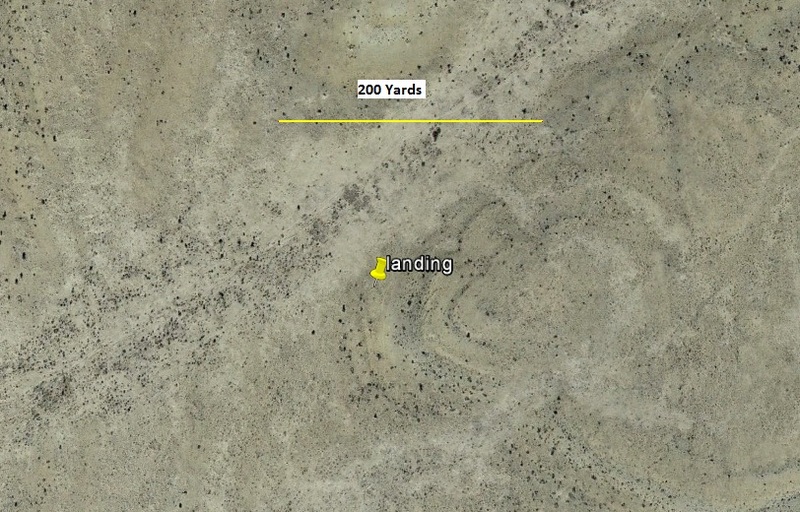 Maybe the playa is the faint light-colored strip. But then again, maybe not . . .
Well, check out this map! Look closely. Not all of Texas is in the Central Time Zone! 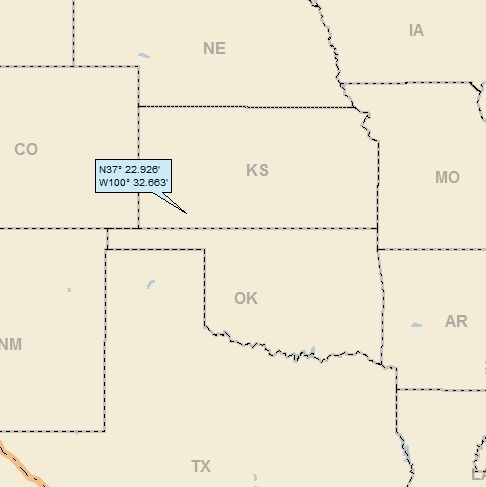 Most importantly, El Paso is in the Mountain Time Zone, and voila! 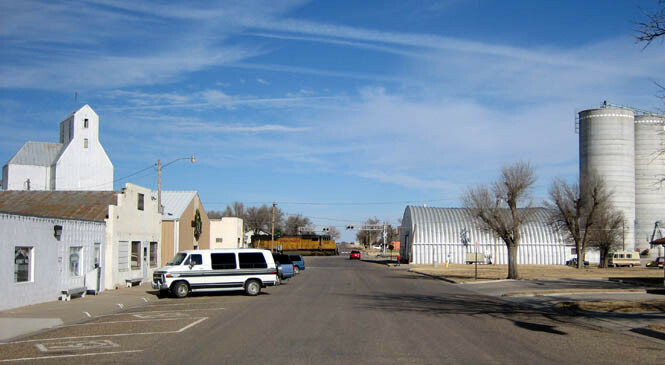 Van Horn becomes the western-most town in the Central! Point of minor Route 90 interest: My wife Jody and I have very good friends who live in New Orleans (Yo! Susan & Kelly), on a side street only two houses away from U.S. 90 (Gentilly Blvd.). 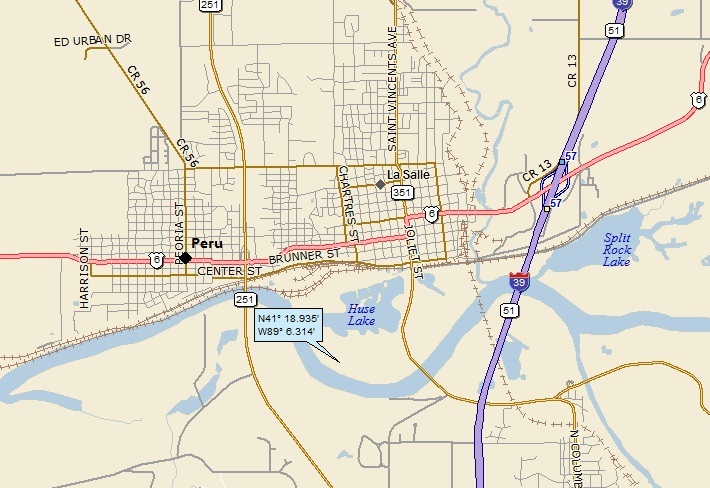 Second point of minor Route 90 interest: Its entire length is part of the “Old Spanish Trail” which is an automobile route conceived of in 1915 and completed in 1920 that connected St. Augustine with San Diego (a trip of 3,000 miles, all on paved roads). 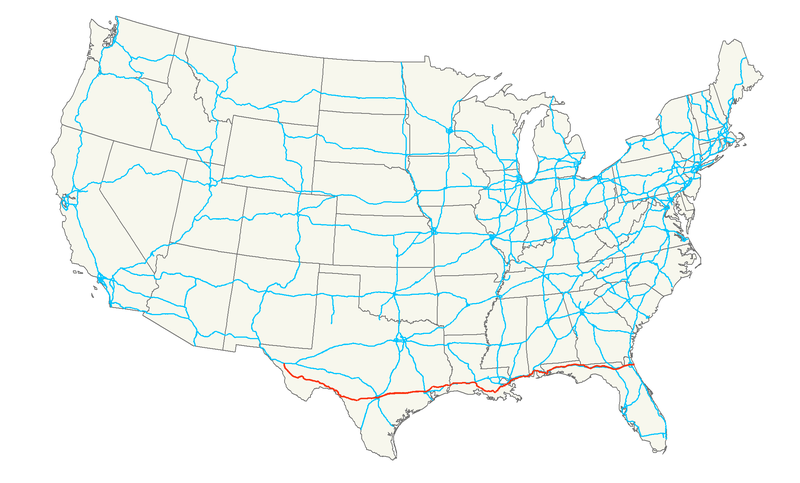 The far western part of the Trail was primarily U.S. Highway 80 (now replaced by I-10 and I‑8). 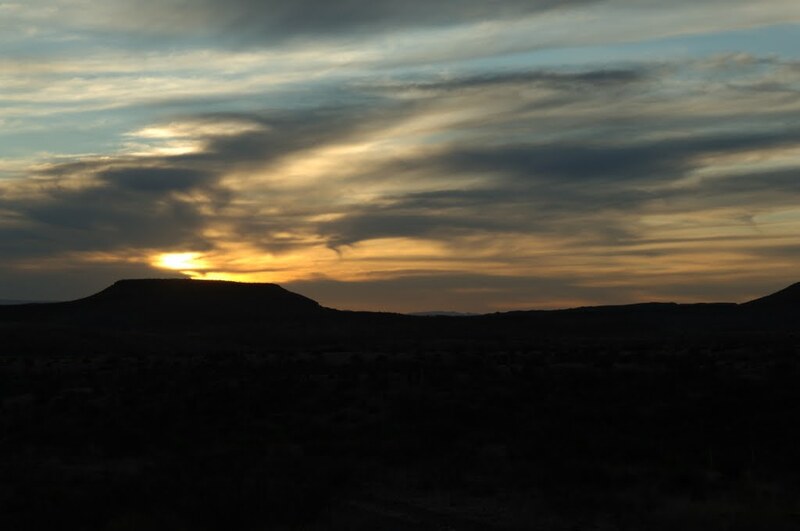 Anglo-Texan settlement of Van Horn began in the late 1850s, supportive of the San Antonio-El Paso Overland Mail route. 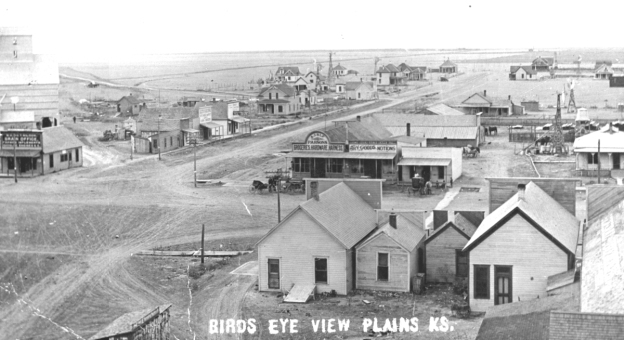 The town is instead named for Lt. James Judson Van Horn, who commanded an army garrison at the Van Horn Wells beginning in 1859. Lt. Van Horn’s command was relatively short-lived as the post was seized by Confederate forces in 1861 and Lt. Van Horn taken prisoner. A lowly lieutenant was a garrison commander? Also, I suspect that very few (if any) towns anywhere have been named for a lieutenant (unless the lieutenant went on to do something else). Of greater interest, the Wiki write-up has a section entitled “Space Tourism,” as well as a section entitled “10,000 Year Clock.” Very interesting . . . (said in the German-accented voice of Arte Johnson as the German soldier on Laugh-In.) Oops, I guess I dated myself a little. I regularly watched (and loved watching) Laugh-In which ran from January 1968 (my senior year in high school) through March 1973 (second semester of my last year in college). Memory’s a funny thing. I felt sure that my whole family sat around the TV watching Laugh-In, but obviously, most of the time, I must have been with college buddies watching it . . . 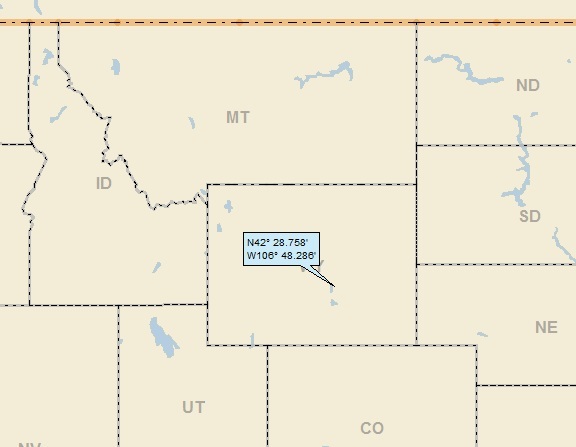 In late 2006, the Wall Street Journal reported that Jeff Bezos, founder and CEO of amazon.com, had acquired 290,000 acres (453 sq mi) of land 25 miles (40 km) north of Van Horn to house his fledgling space tourism company, Blue Origin. Blue Origin is a privately funded aerospace company set up by Amazon.com founder Jeff Bezos. The company is developing technologies to enable private human access to space with the goal of dramatically lower cost and increased reliability. It is employing an incremental approach from suborbital to orbital flight, with each developmental step building on its prior work. The company motto is “Gradatim Ferociter”, Latin for “Step-by-Step, Ferociously.” Blue Origin is developing a variety of technologies, with a focus on rocket-powered Vertical Takeoff and Vertical Landing vehicles for access to suborbital and orbital space. 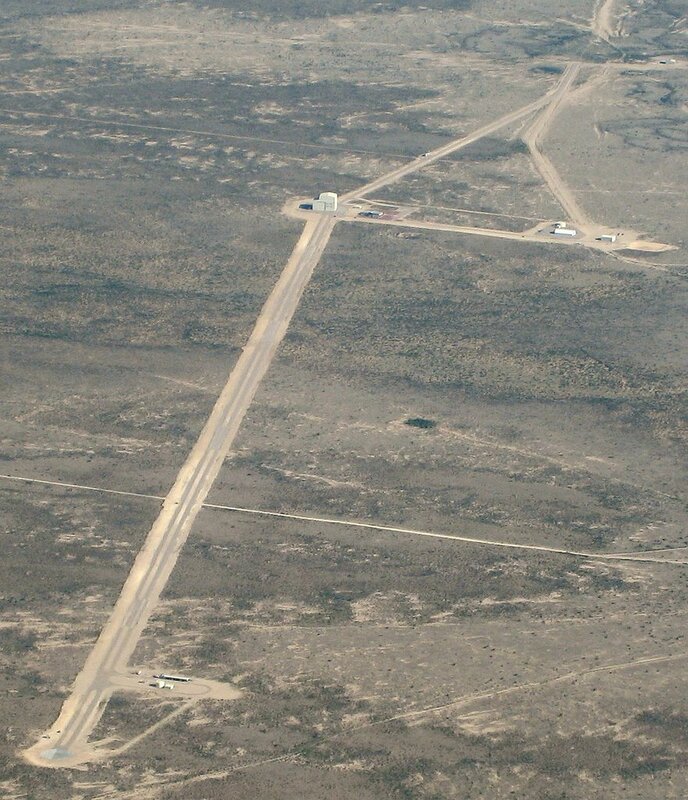 Initially focused on sub-orbital spaceflight, the company has built and flown its New Shepard spacecraft design at their Culberson County, Texas facility. 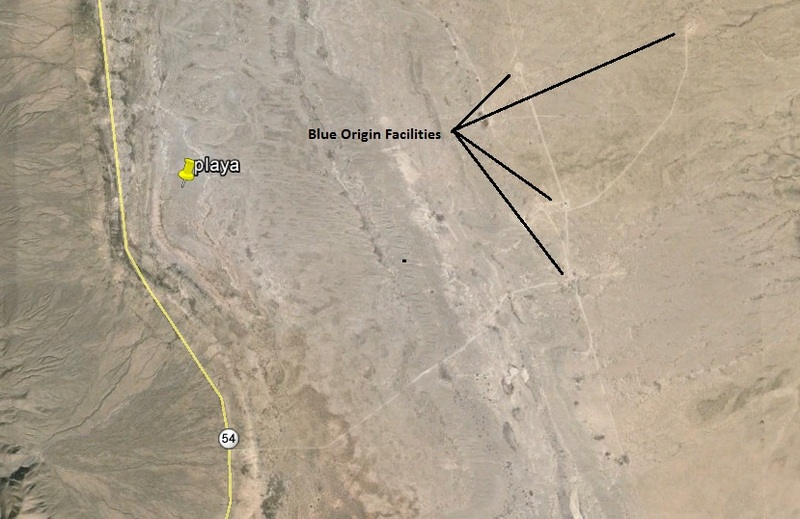 Blue Origin hoped to be flying customers by the end of 2012. As of 2013, however, the company website has made no statements about the date of its first flights. Ouch! That landing seemed a little rough . . . 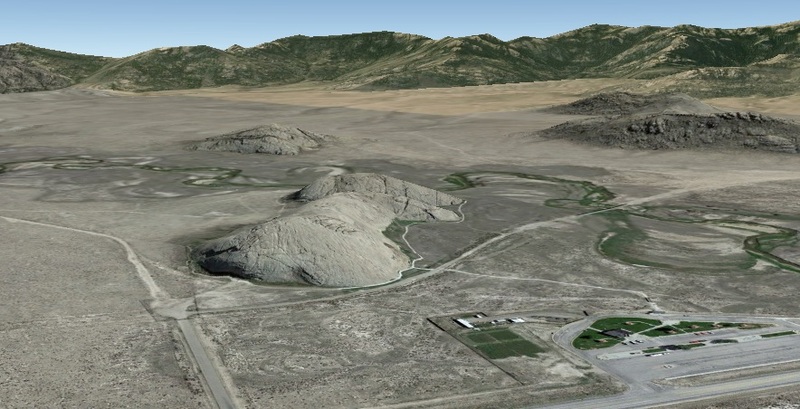 In 2009, The Van Horn Advocate announced that the Long Now Foundation was starting geologic testing for an underground space to house a 10,000 Year Clock of the Long Now, on the Bezos ranch, north of Van Horn. This “Long Now” clock was immediately familiar to me. 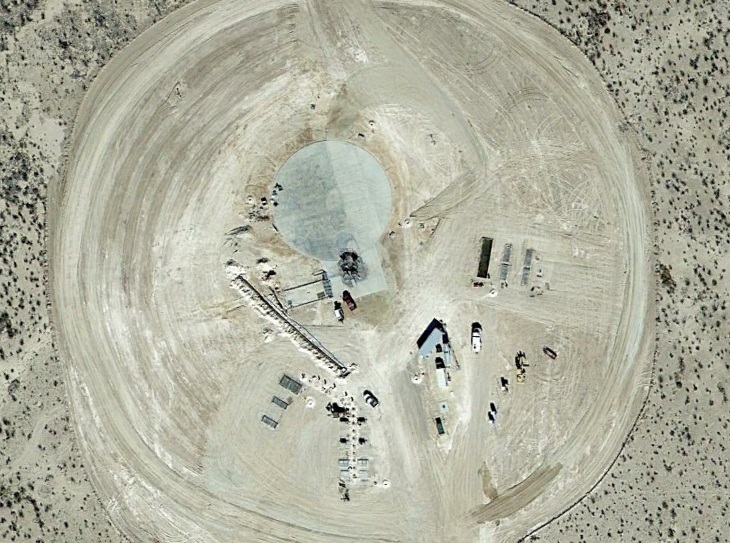 I searched my landings, and son of a gun there it was – in my Baker NV post (June 2010), I wrote about the Long Now Foundation and their 10,000 year clock. 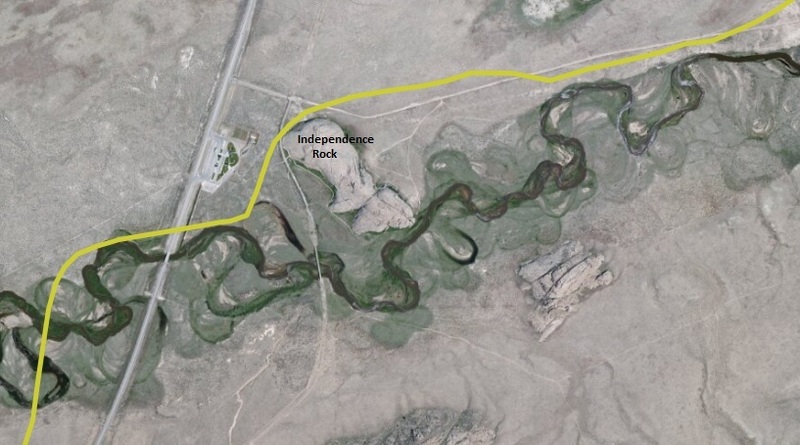 It turns out that a location near Baker had been selected by the Foundation to build and house the 10,000 year clock. 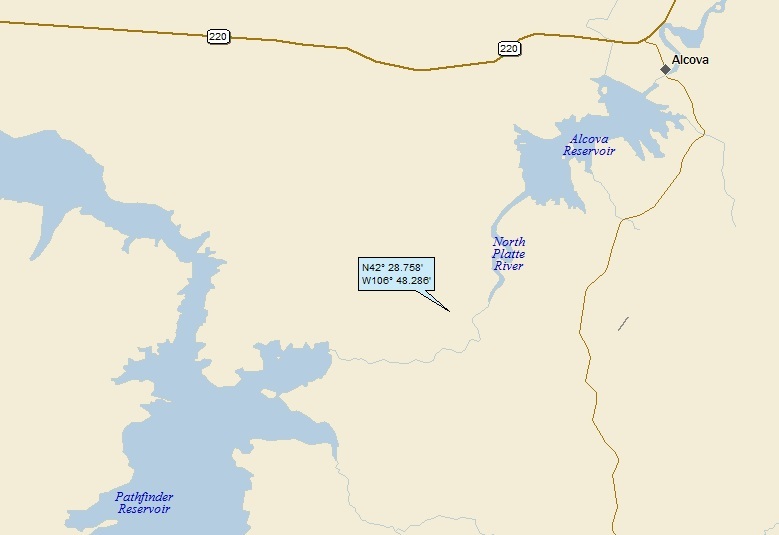 Well, it looks like they scrapped the Baker site and are now focusing on the Van Horn site, perhaps lured by Jeff Bezos and Blue Origin. As with Blue Origin, I strongly suggest that my readers visit the Long Now Foundation website: longnow.org. Pretty wild. The Long Now Foundation, established in 1996, is a private, non-profit organization based in San Francisco that seeks to become the seed of a very long-term cultural institution. It aims to provide a counterpoint to what it views as today’s “faster/cheaper” mindset and to promote “slower/better” thinking. The Clock is now being machined and assembled in California and Seattle. 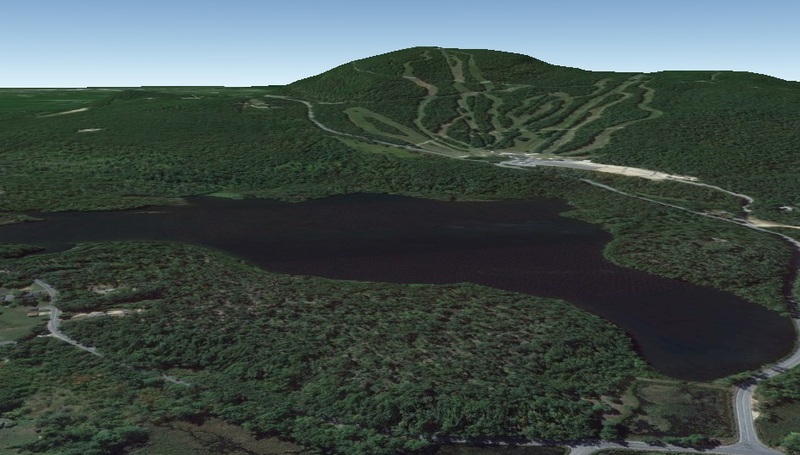 Meantime the mountain in Texas is being readied. Why would anyone build a Clock inside a mountain with the hope that it will ring for 10,000 years? Part of the answer: just so people will ask this question, and having asked it, prompt themselves to conjure with notions of generations and millennia. Landing number 2083; A Landing A Day blog post number 511. 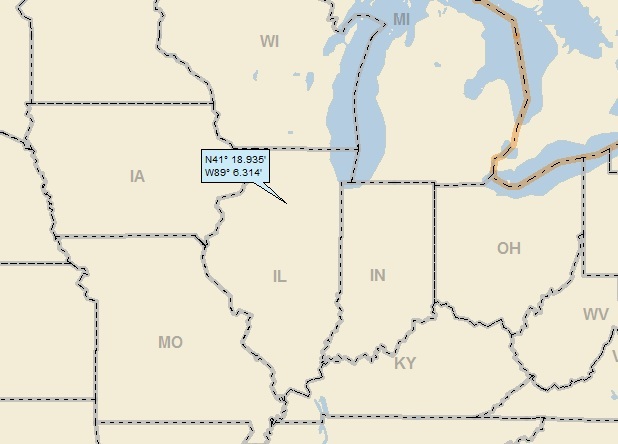 Obviously, I landed in the Illinois R watershed (20th hit); on to the MM (818th hit). 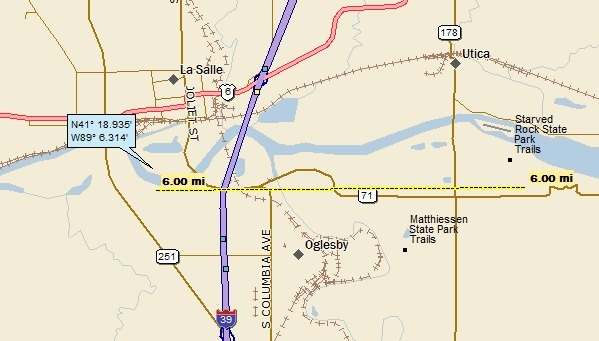 Here’s a streams-only shot, showing the course of the Illinois R as it cuts diagonally across Illinois before discharging to the Mississippi a little north of St. Louis. My guess is that this is a springtime photo, and the field has just been plowed and disked (and probably planted). My thought is that it turned green not long thereafter. In 1673, French explorers Louis Jolliet and Father Jacques Marquette passed through here on their way up the Illinois from the Mississippi. 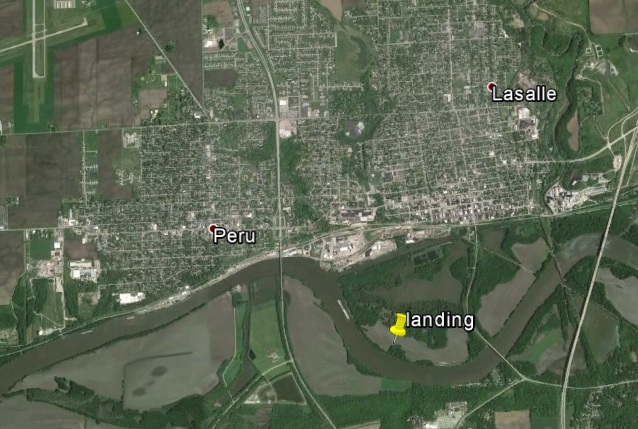 When the French claimed the region (and, indeed, the entire Mississippi Valley), they built Fort St. Louis atop Starved Rock in the winter of 1682-83 because of its commanding strategic position above the last rapids on the Illinois River. Pressured from small war parties of Iroquois in the French and Indian wars, the French abandoned the fort by the early 1700s. The fort became haven for traders and trappers, but by 1720 all remains of the fort had disappeared. 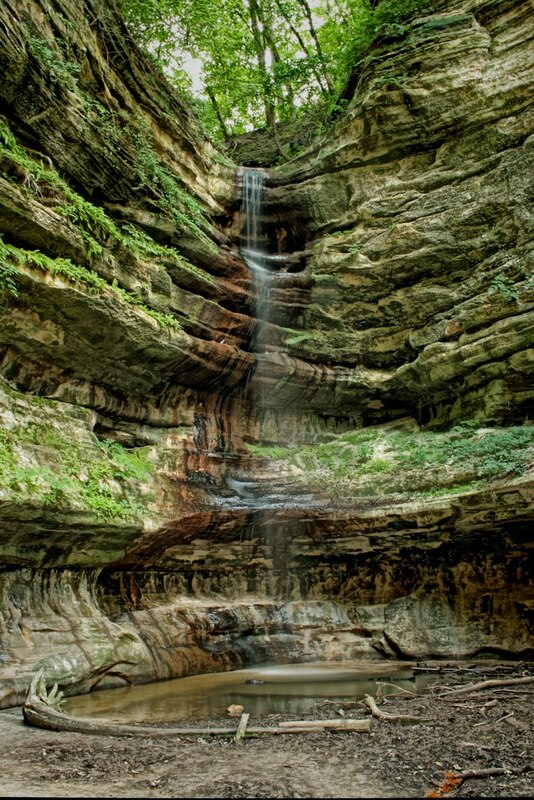 Starved Rock State Park derives its name from an Indian story of injustice and retribution. In the 1760s, Pontiac (chief of the Ottawa tribe upriver from here) was slain by an Illiniwek while attending a tribal council in southern Illinois. 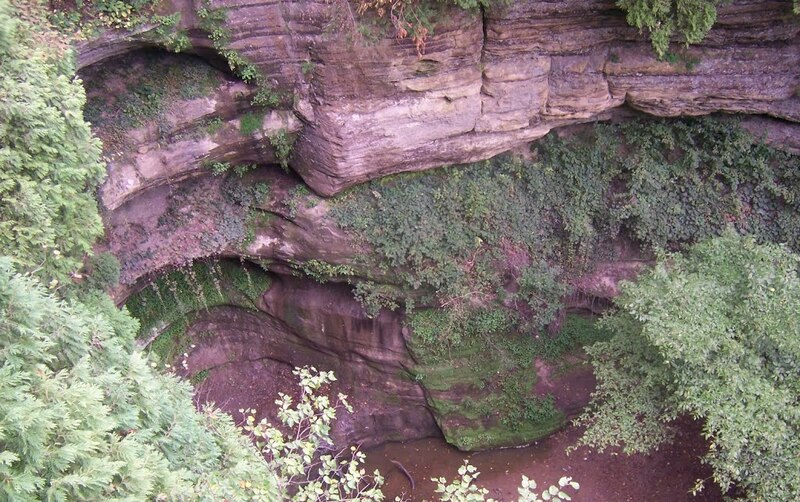 A catastrophic flood known as the Kankakee Torrent, which took place somewhere between 14,000 and 17,000 years ago (before humans occupied the area), helped create the park’s signature geology and features. 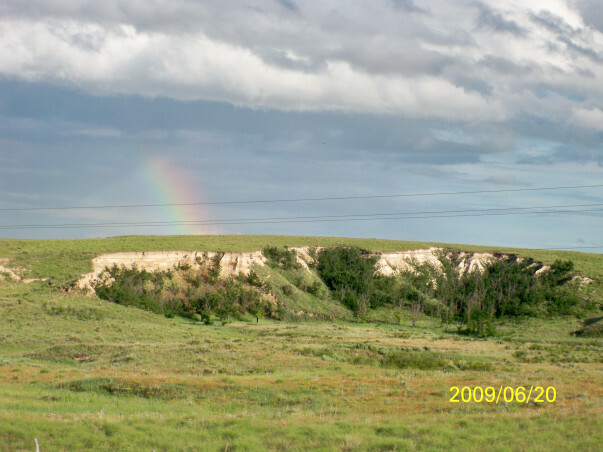 These sandstone bedrock features (cliffs and canyons) are very unusual for the central plains. A quick note. This all sounds familiar, and hearkens me back to a landing in the Wisconsin Dells (my February 2013 Mauston Wisconsin post). A glacial flood (a different glacial flood) very similarly carved out the beautiful sandstone features there as well. Anyway, Wiki tells us that the melting glaciers formed glacial Lake Chicago (a precursor to Lake Michigan), and that a breach of the southern shoreline caused this catastrophic flood. 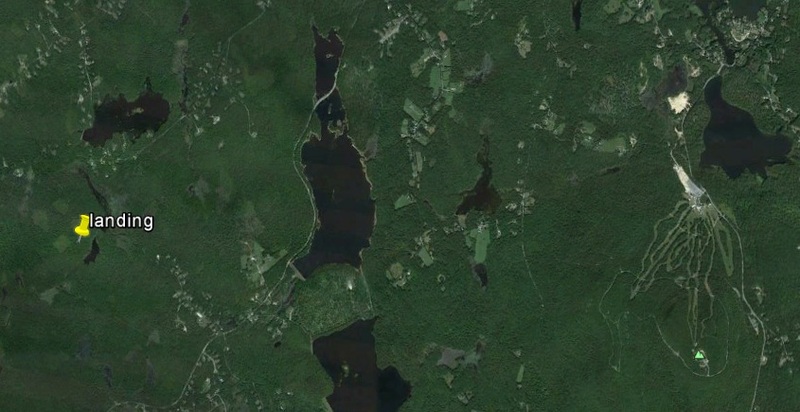 OK, so some geologists think it was a different glacial lake further east. Whatever. 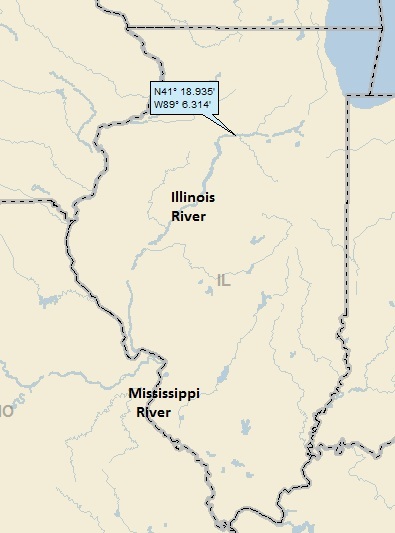 The Kankakee Torrent was responsible for the rapid creation of several geological features of Illinois. Both the Kankakee River and Illinois River largely follow paths carved out by the torrent, a process that is believed to have taken only days. 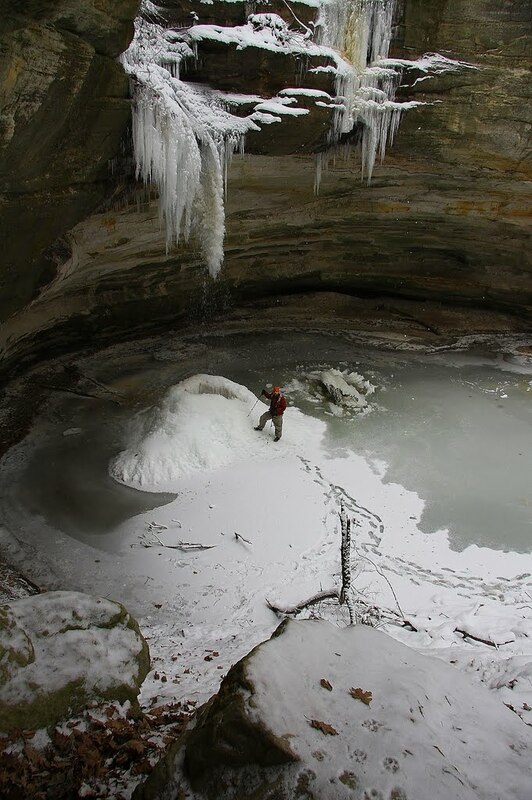 Most notable today is a region in north-central Illinois known as Starved Rock; while most of Illinois is located on a low-lying plain with little variation in elevation, Starved Rock State Park features several canyons which were created in the Kankakee Torrent. Landing number 2082; A Landing A Day blog post number 510. Dan – Phew. An eastern USer after all of those western OSers . . . MA; 5/7; 2/10; 150.4. 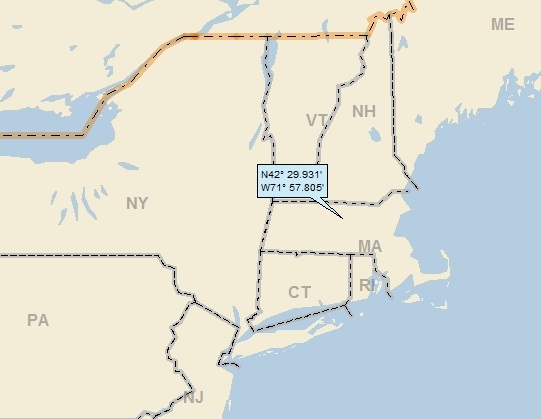 And for those of you who may have thought that my random number generator had some sort of western bias, let me say that today I “landed” twice in the Atlantic Ocean, once in the Gulf of Mexico, and once in eastern Canada before I finally sunk my boots in some good ol’ American soil . . .
WY (OS); and finally . . .
For those of you readers who have no clue (and don’t really care) what this is all about, my apologies for taking up your time. If you do care but aren’t up to speed, click HERE and then HERE. I could have featured some other towns in the general area, but must admit that I was a little intrigued with Princeton, what with me being a Jersey guy and all. In fact, I’m a central Jersey guy (and the real Princeton is in Central Jersey). In fact, my youngest actually went to Princeton. So anyway, I figured I’d see what Princeton MA has to say for itself. Wow. A bunch of woods, eh? I’ll zoom back a little. Still a bunch of woods . 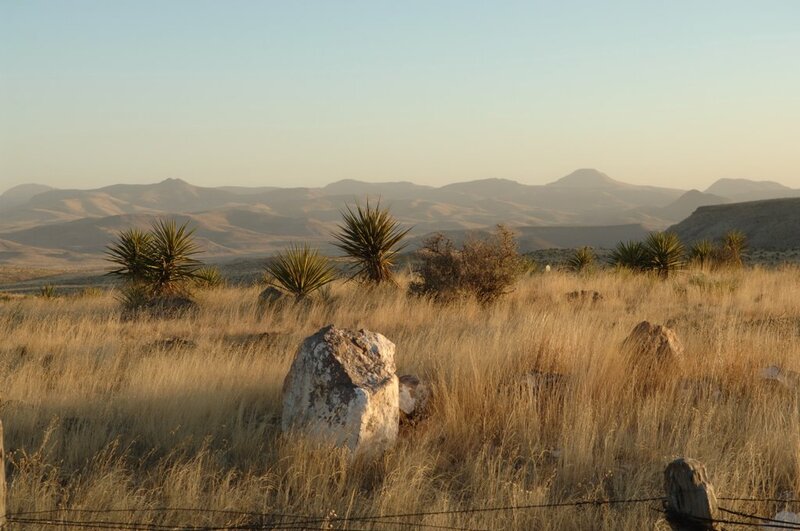 . .
After all of my western landings, I must chuckle a little at the temerity of us easterners to call this a mountain. Hey – it’s all relative . . . The Wests Branch of the Ware River is a new river for me, as is the Ware River itself. 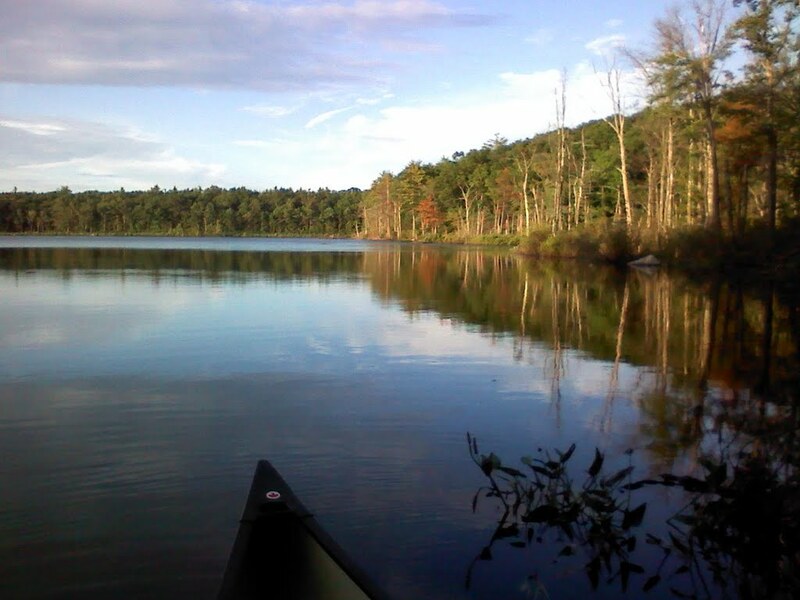 This was my second landing in the Chicopee R watershed; on to the Connecticut R (13th hit). According to tradition, in 1675 Mary Rowlandson (who was kidnapped by Indians during King Philip’s War) was ransomed upon Redemption Rock [located within the town of Princeton], by King Philip. 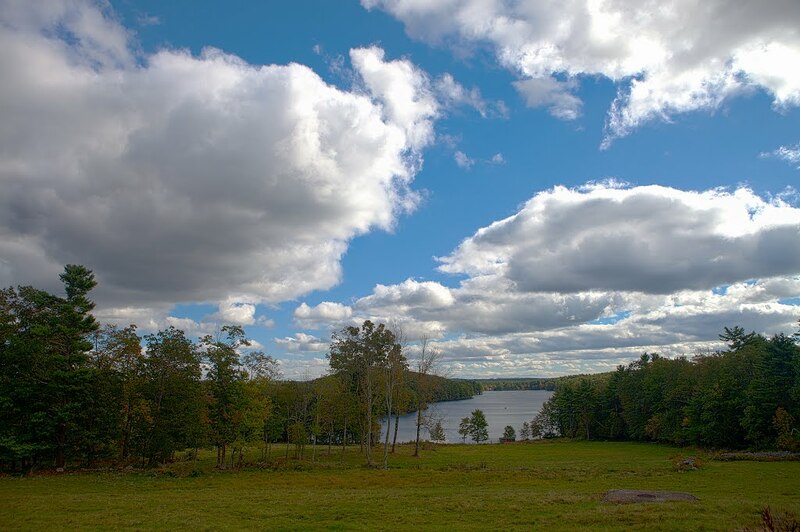 Redemption Rock is a colonial-era historic site in Princeton, Massachusetts. 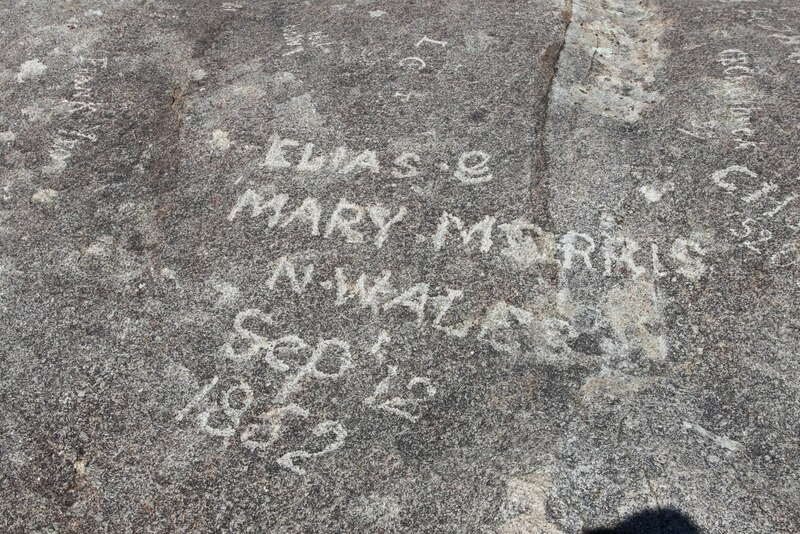 In 1676, during King Philip’s War, the release of Mary Rowlandson (the wife of a Puritan minister) from her Native American captors was negotiated atop a granite ledge known as Redemption Rock. Rowlandson would later write about her experience in “A Narrative of the Captivity and Restoration of Mrs. Mary Rowlandson,” considered a seminal work in the American literary genre of captivity narratives. Mary Rowlandson (1637 – 1711) was a colonial American woman who was captured by Indians during King Philip’s War and held for 11 weeks before being ransomed. King Philip’s War was an armed conflict between Native American inhabitants of present-day New England and English colonists and their Native American allies in 1675–78. The war is named after the main leader of the Native American side, Metacomet, known to the English as “King Philip” [who was killed in 1676, two years before the war ended]. The war was the single greatest calamity to occur in seventeenth-century Puritan New England. In the space of little more than a year, twelve of the region’s towns were destroyed and many more damaged, the colony’s economy was all but ruined, and many of its population was killed, including one-tenth of all men available for military service. On February 10, 1675, the settlement of Lancaster, in the Massachusetts Bay Colony, was attacked by Indians. The Indians burn houses down and kill several residents and wounding more. They take many of the survivors captive, including Mary Rowlandson and her three children. Mary and her youngest child are among the injured while others of her family, like her brother-in-law, are killed. The Indians lead the captured survivors from their settlement into the wilderness. Rowlandson and her youngest, Sarah are allowed to stay together, but her two oldest, Joseph and Mary, are separated. 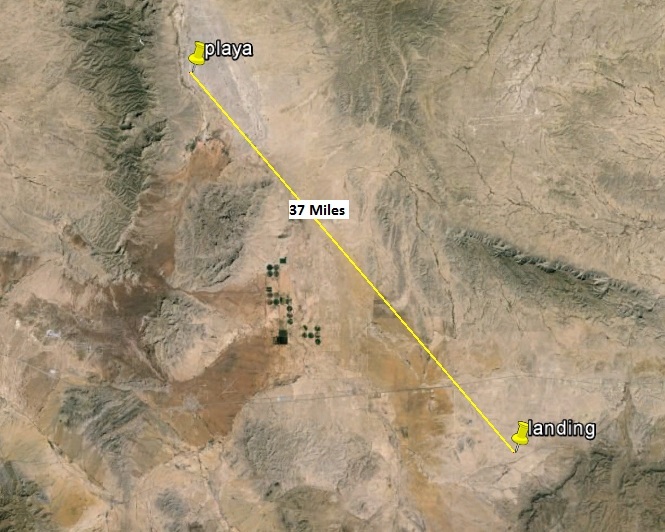 After spending a night in a nearby town, the Indians and the captives head further into the wilderness. The journey is difficult for the injured Rowlandson and her daughter. 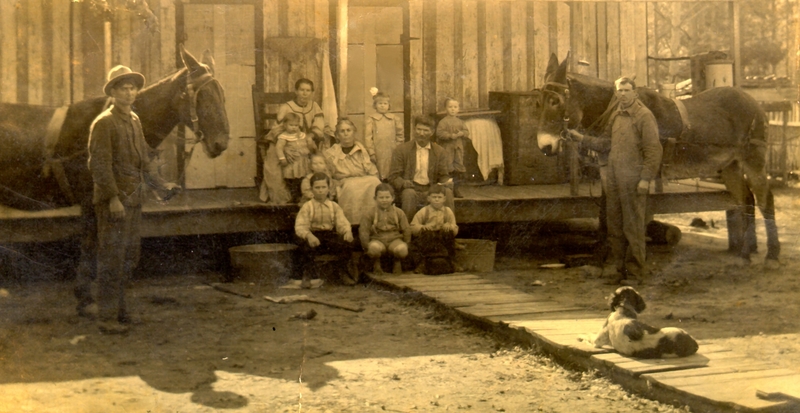 They reach an Indian settlement called Wenimesset. After staying in Wenimesset for about a week, Rowlandson’s injured daughter, Sarah, dies. Rowlandson is sold to another Indian who is related to King Philip by marriage. They bury Rowlandson’s dead daughter, and she is allowed to visit her oldest daughter Mary who is also being held in Wenimesset, and her oldest son who is allowed to visit from a nearby Indian settlement. The Indians give Rowlandson a Bible where she finds hope. The Indians decide to head north and Rowlandson is again taken away from her family and “friends” she made. The Indians move quickly through the forest; Mary suspects the British army must be close by.
. . . they [the Indians and Rowlandson] meet messengers telling Rowlandson she must go to Wachuset where the Indians will discuss the possibility of returning her to freedom. She reaches Wachuset and speaks to King Philip who guarantees she will be free in two weeks. The council asks how much her husband would pay for her ransom and they send a letter to Boston saying she can be free for twenty pounds. The ransom is paid, and Mary and her family are released. She is reunited with her husband after 11 long weeks. They stay with a friend in Concord for a while until Rowlandson’s sister, son, and daughter are returned. Now back together, the family builds a house in Boston where they live until 1677. As you regular ALAD readers know, I’ve discussed Indian conflicts many many times. But nearly all are associated with my western landings. We (I, anyway) tend to forget that the Indians (of course) were everywhere in America; and of course, the first conflicts would have pre-1700’s up and down the eastern seaboard. Landing number 2081; A Landing A Day blog post number 509. Dan – Are you kidding me? Nine out of ten landings are OSers? Yup, thanks to this landing in . . . WY; 74/66; 1/10; 151.0. 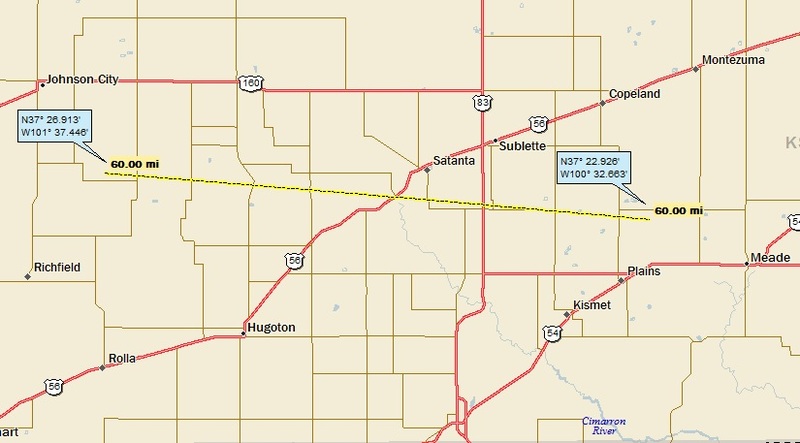 My watershed analysis is pretty straight-forward: North Platte R (27th hit); to the Platte (60th hit); to the Missouri (379th hit); to the MM (817th hit). 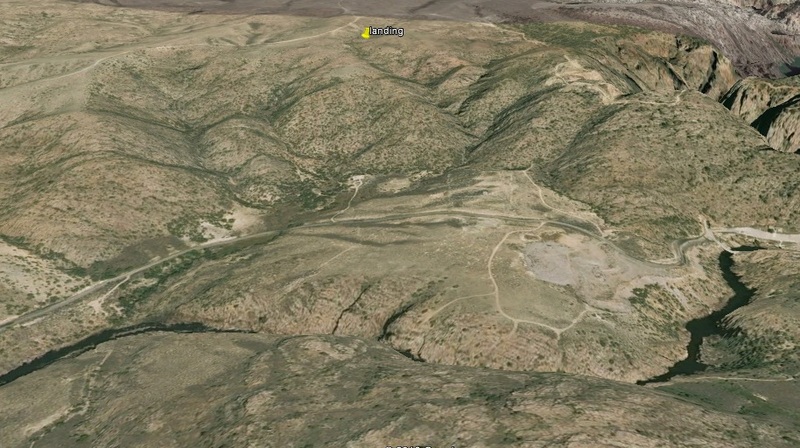 I noticed a steep canyon just to the east and north. It turns out this is Fremont Canyon. 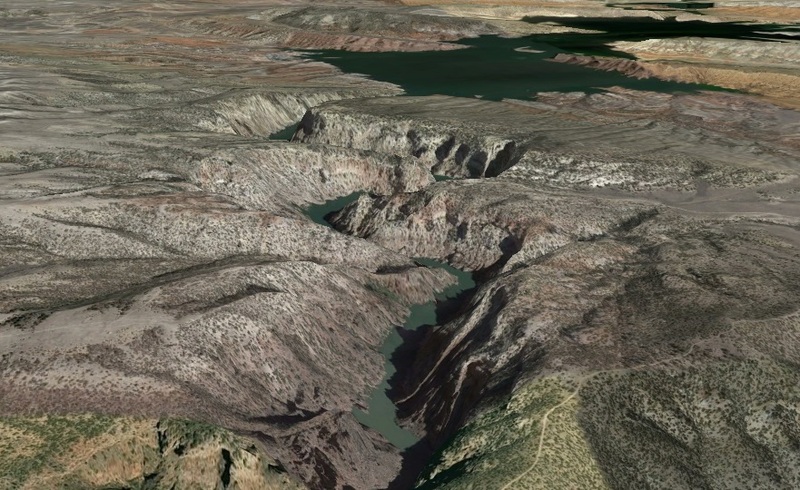 Here’s a GE shot of the Canyon, looking downstream towards Alcova Reservoir (more about the Fremont Canyon in a bit). 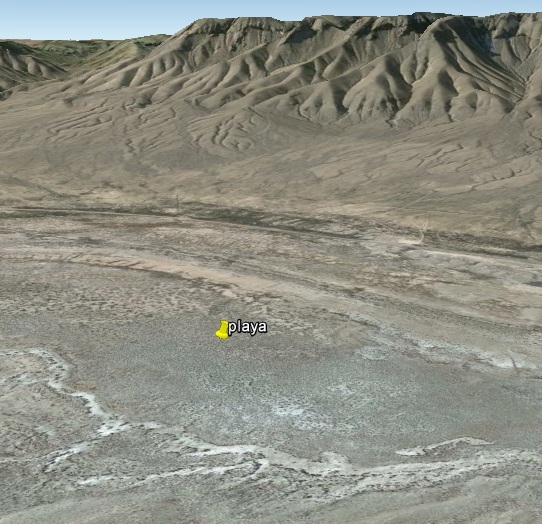 Wiki says that 76 people live there. That must include the suburban sprawl that don’t show up on this photo. 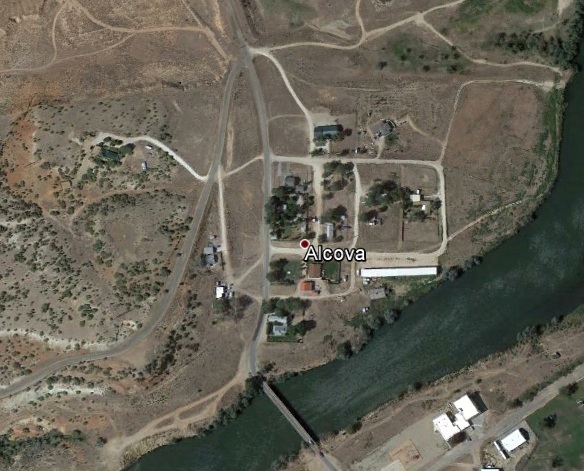 Not surprisingly, there’s really nothing about Alcova to talk about. I have some GE Panoramio shots of the Canyon, but I’m going to save them for the end of the post. 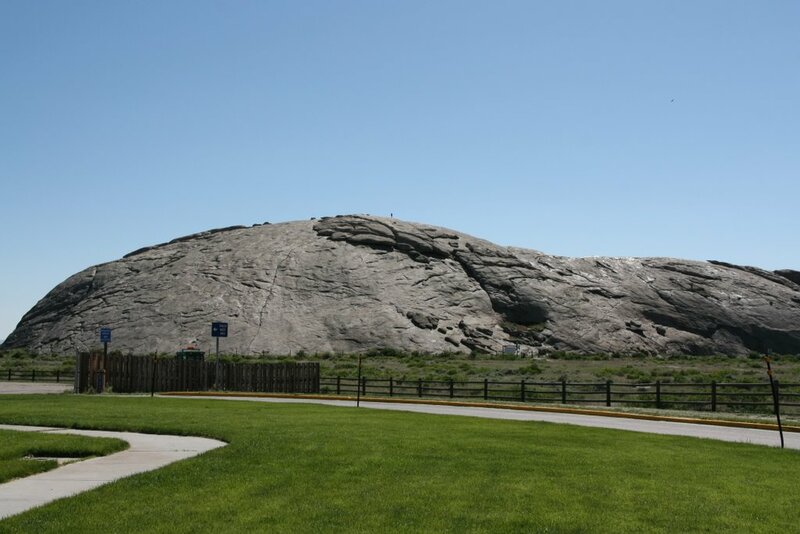 Fremont carved a large cross into the rock monolith, which was blasted off the rock on July 4, 1847 by some among hundreds of California and Oregon emigrants who had gathered on the site. Many Protestants considered the cross Fremont carved to be a symbol of the Pope and Catholicism. John Frémont was actually a member of the Episcopal Church (United States). In November 1856, about 500 Mormon emigrants in the Martin Handcart Company were halted for five days in the Cove by snow and cold while on their way to Salt Lake City. 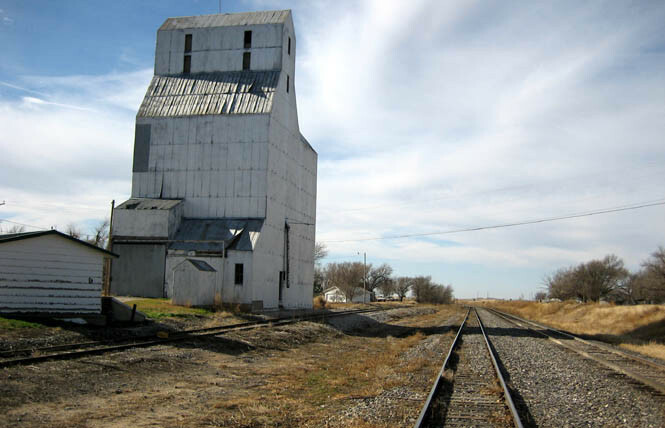 The Martin Handcart company had begun its journey on July 28, 1856 which was dangerously late in the season and would ultimately lead to the disaster. 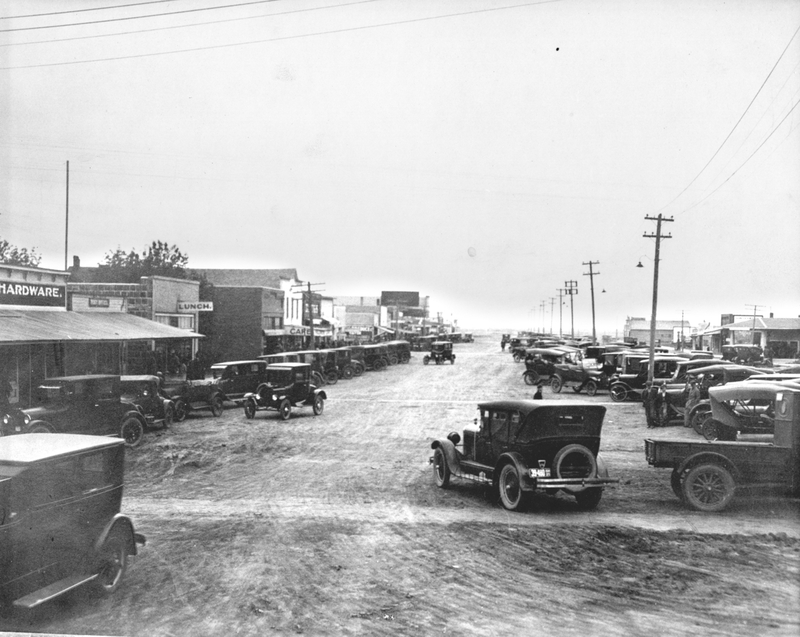 Although the number who died in the Cove is unknown, more than 145 members of the Martin Company died before reaching Salt Lake City. The handcart pioneers were participants in the migration of Mormons to Salt Lake City, Utah, who used handcarts to transport their belongings. The Mormon handcart movement began in 1856 and continued until 1860. 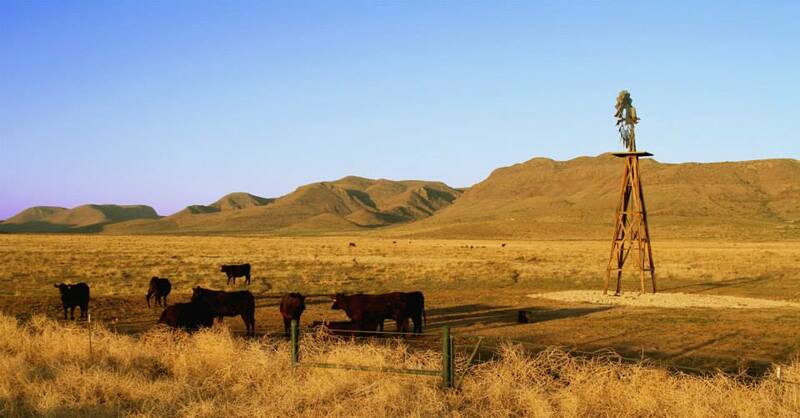 Motivated to join their fellow Church members in Utah but lacking funds for full ox or horse teams, nearly 3,000 Mormon pioneers from England, Wales, Scotland and Scandinavia made the journey from Iowa or Nebraska to Utah in ten handcart companies. Although fewer than 10 percent of the 1846–68 Latter-day Saint emigrants made the journey west using handcarts, the handcart pioneers have become an important symbol in Mormon culture, representing the faithfulness and sacrifice of the pioneer generation. Man, those Mormons were something . 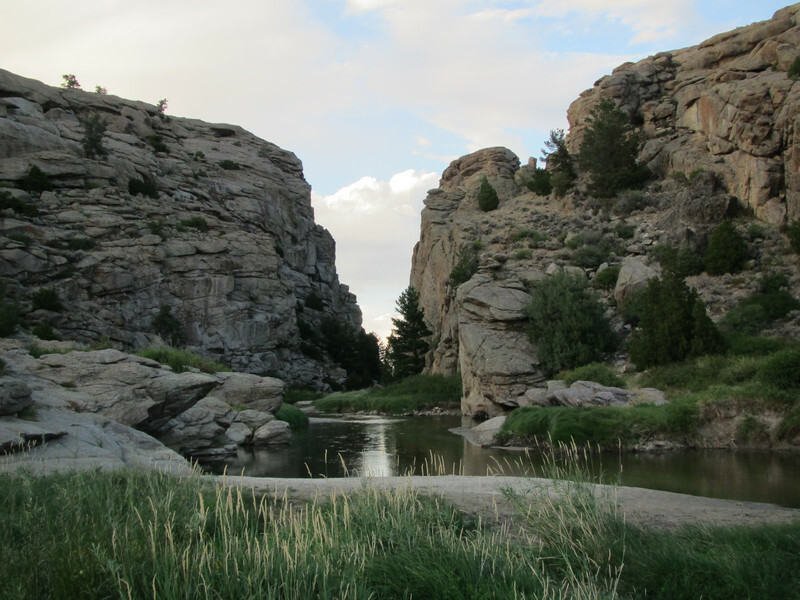 . .
Devil’s Gate is a narrow cleft carved through a bedrock ridge by the Sweetwater River. 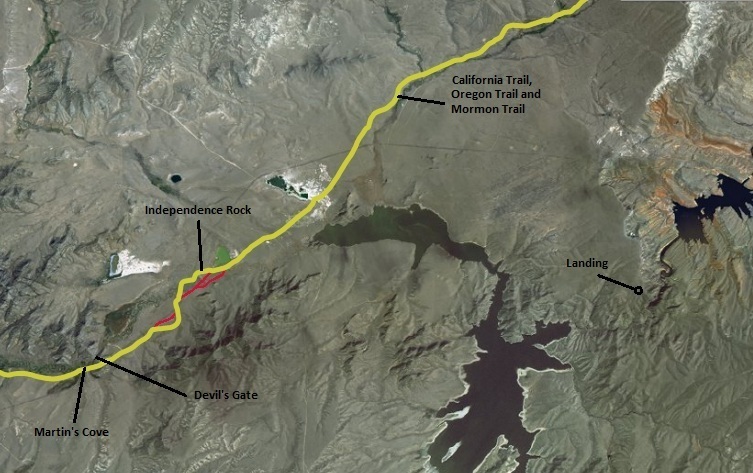 Devil’s Gate became visible approximately 15 miles to the east along the Emigrant Trail. The gorge was impassable to wagons, and the trail passed to the south of the ridge, but this dark, gloomy canyon intrigued the emigrants. 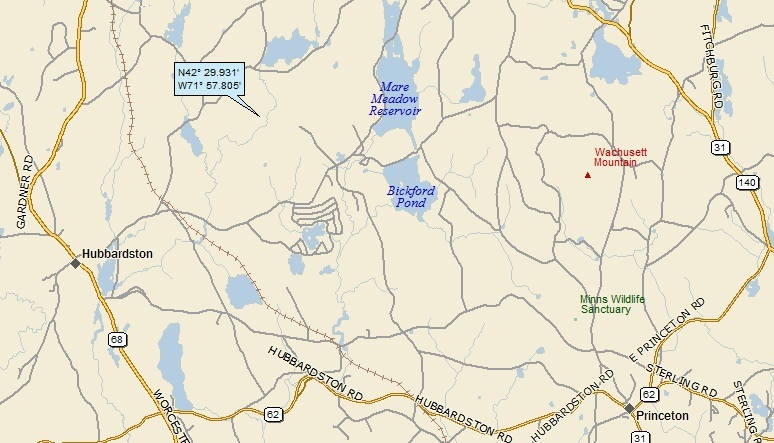 Many camped here, and almost all took the detour to inspect the gorge. 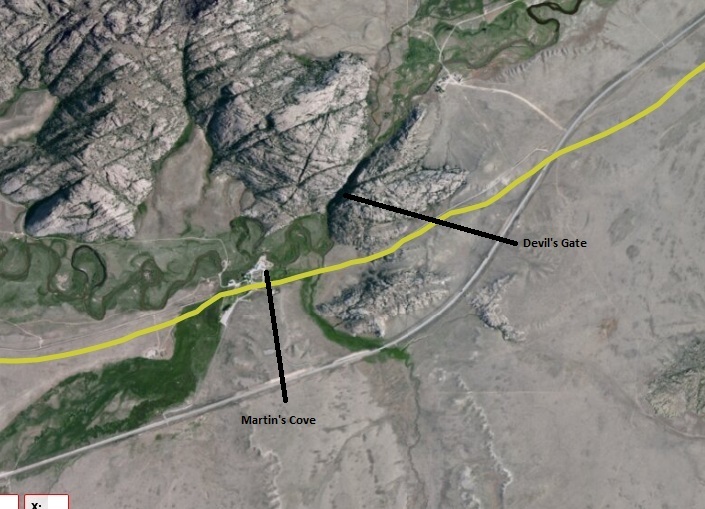 Devil’s Gate is a remarkable example of superposed or an antecedent drainage stream. 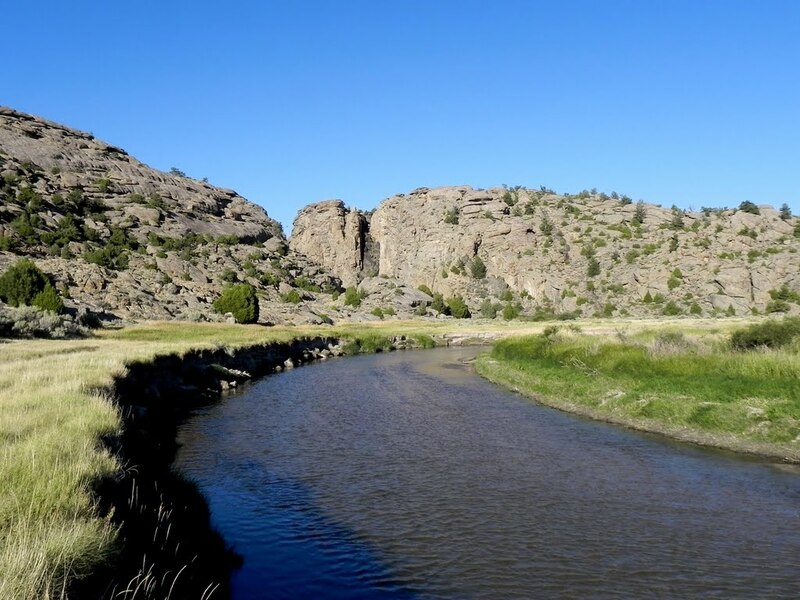 The Sweetwater River cuts a narrow 100-meter deep slot through a granite ridge, yet had it flowed less than a kilometer to the south, it could have bypassed the ridge completely. 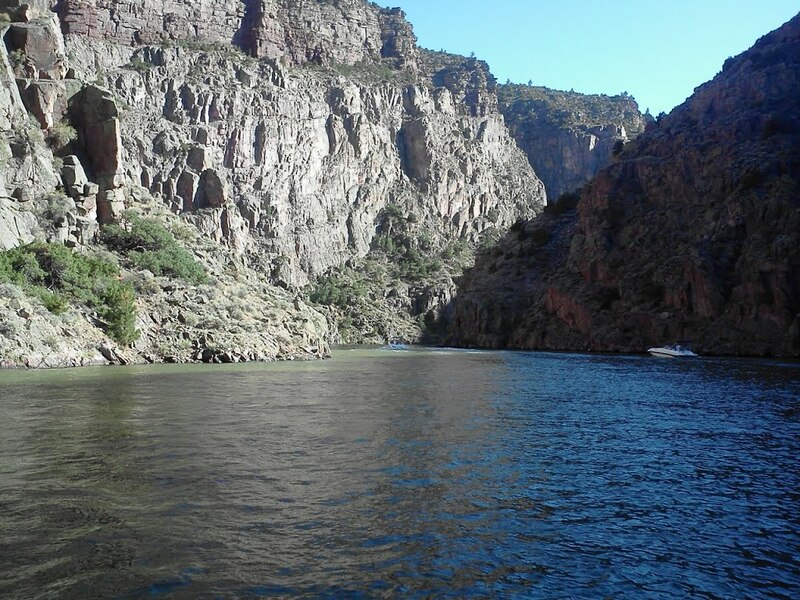 The gorge was cut because the ridge of rock was originally buried by valley fill sediments. 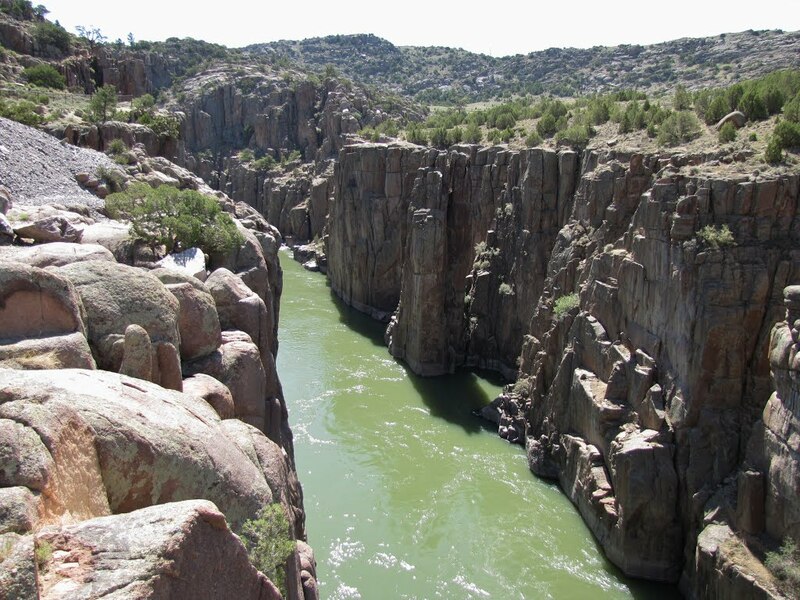 The river cut downward and when it hit granite, kept on cutting. It was a matter of pure chance that the river hit the buried ridge where it did. 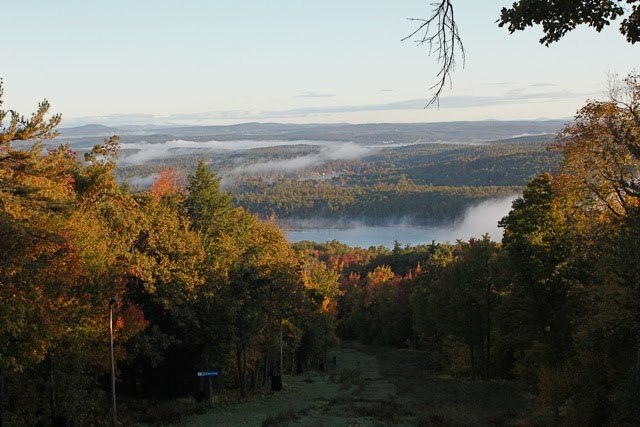 Here’s a GE shot that show’s Devil’s Gap (to the left). You can see that it seems as though the river could have much more easily flowed around the ridge instead of through it . . . Landing number 2080; A Landing A Day blog post number 508. 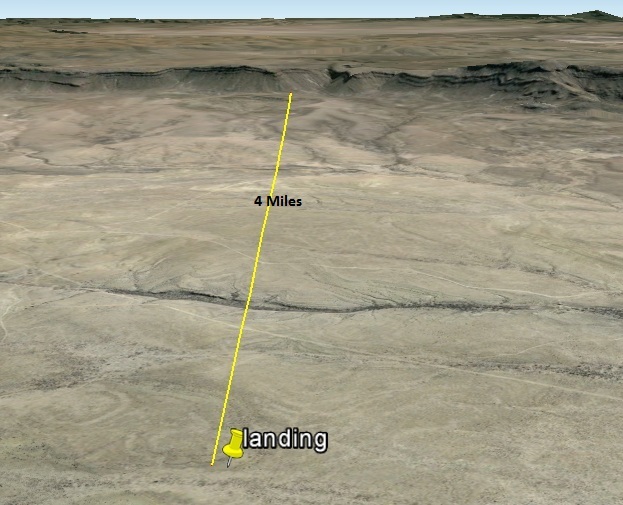 Dan – Incredibly (thanks to today’s landing), I have landed in the same state for the fourth time in my last 16 landings. This is particularly amazing, considering that this state ranks a measly 29th out of 48 (the lower 48) in size. Sixteen landings ago, this state was a solid USer. But today’s landing has turned the tide, and this state now joins the ranks of the OSers. The new member of the OS club is . . . LA; 36/35 (see what I’m talking about? ); 3/10; 150.6. 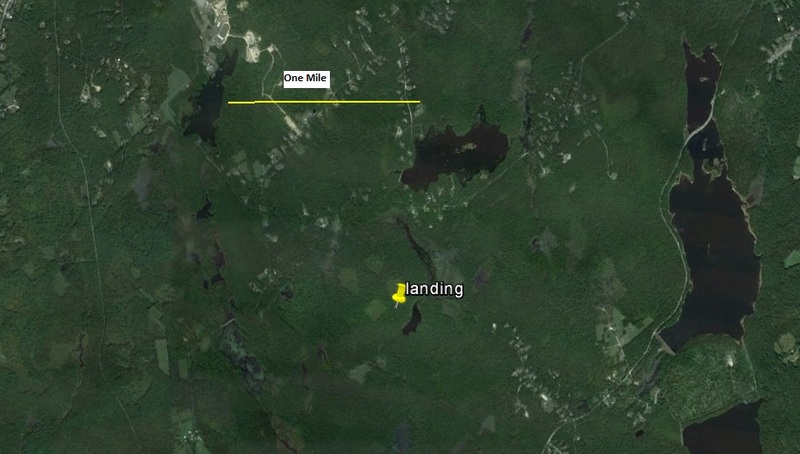 I’ve now landed in OSers 8 of my last 9 landings . 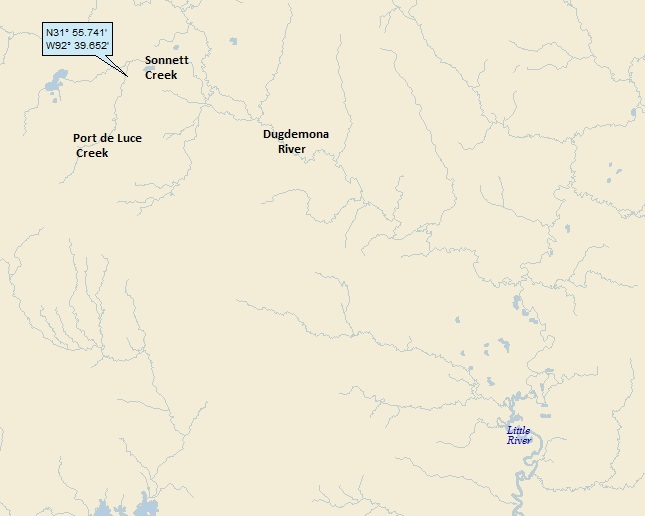 . .
As you can see, water flows from the Port de Luce to the Sonnett Ck; to a new river for A Landing A Day, the Dugdemona R; on to another new river for me, the Little. 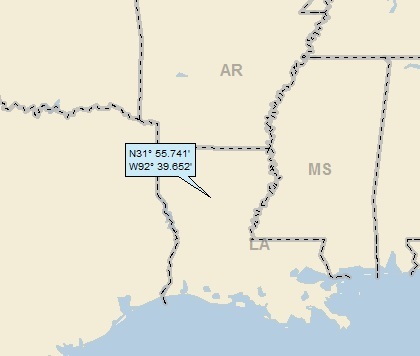 From there (off the above map), we go to the Black R (12th hit); to the Red R (55th hit); to the Atchafalaya (62nd hit). 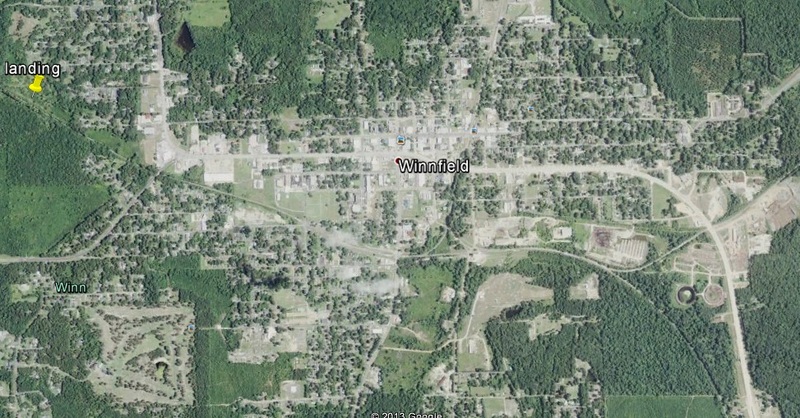 Checking out Winnfield, I find that its primary claim to fame involves the famous (and/or infamous, depending on your point of view) Long clan. 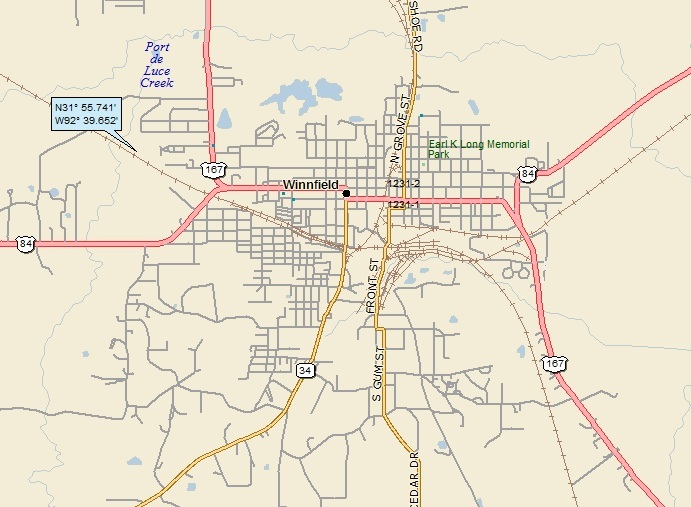 That’s right, Winnfield is the hometown of Huey P. Long and his younger brother Earl K. Long. Earl Kemp Long (1895 – 1960) was the Governor of Louisiana for three non-consecutive terms. Long termed himself the “last of the red hot poppas” of politics, referring to his stump-speaking skills. Wow. Great fun around the table at Thanksgiving dinner, eh? I wonder what Mom & Dad thought . . .
For those of you who haven’t read my Baton Rouge post (and don’t know much about Huey Long), he was assassinated in the Louisiana State Capitol Building in 1935. So, that’s about it for Winnfield. Not wanting to call it a day, I figured that I’d do a feature on the Atchafalya River. 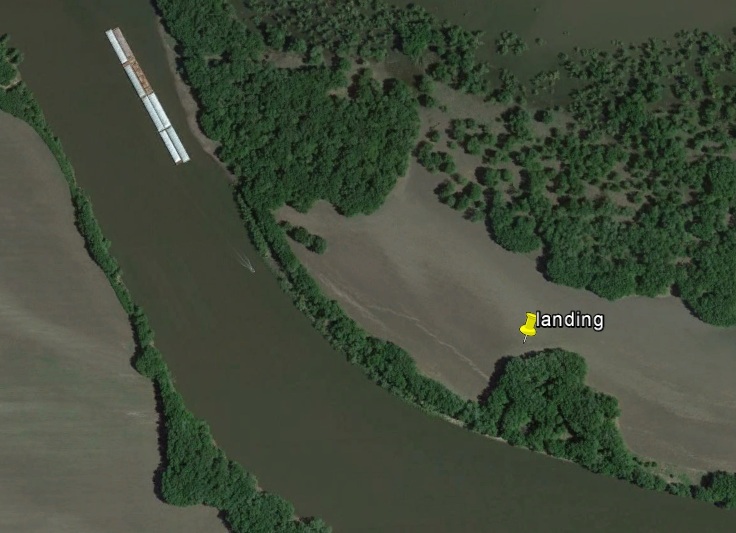 This landing marks the 55th time I’ve landed in the Atchafalya watershed (the 15th time since I began blogging), but the first time I’ve actually written a piece on the river . . .
First off, I think it’s a wonderful name. It just rolls off the tongue: ah chaf fa LIE ya. 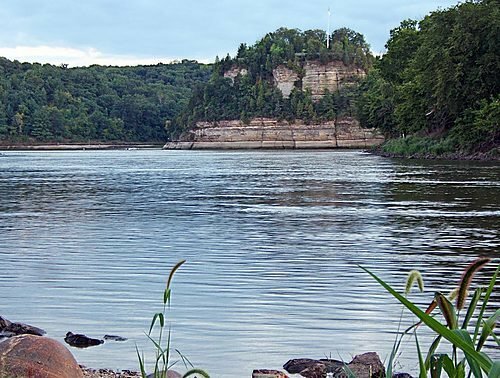 But of real interest is the history of the river, and how we Americans have played a crucial part in the river’s actual essence – its physical nature, identity and fate. 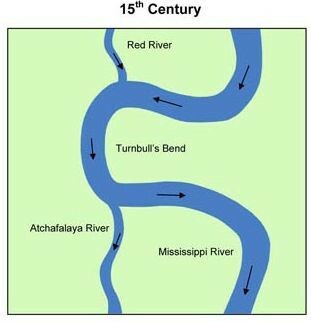 In the 15th century, a bend in the Mississippi known as Turnbull’s Bend joined the river with the parallel Red River; the flow of the Red River joined the Mississippi and the much smaller river flowing south from Turnbull’s bend became the Atchafalaya. 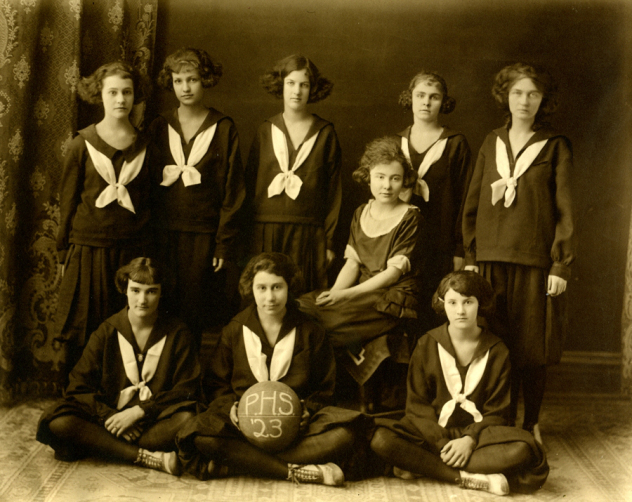 In the heyday of steamboats along the Mississippi River, it took a boat several hours to travel the bend’s 20 miles. To reduce travel time, Captain Henry M. Shreve, a river engineer and founder of Shreveport, La., dug a canal in 1831 through the neck of Turnbull’s Bend. At the next high water, the Mississippi roared through this channel. 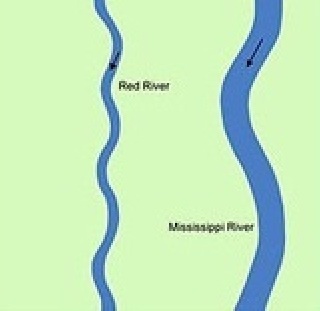 With the Mississippi River taking a new course, the Red River began emptying into the smaller Atchafalaya River. 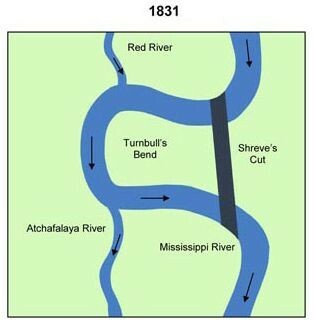 Also, Shreve’s cut altered the flow so that Mississippi water and Atchafalaya water flowed back and forth through the lower part of Turnbull’s Bend (the Lower Old River) depending on the season. 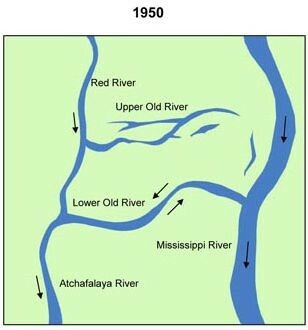 Between 1850 and 1950, the percentage of Atchafalaya’s share of the total flow of the two rivers increased from less than 10 percent to about 30 percent. 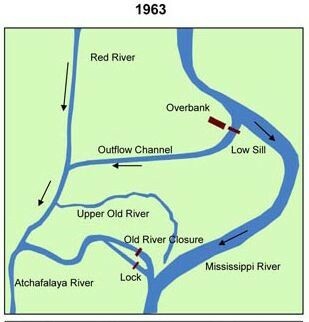 By 1953, the U.S. Army Corps of Engineers concluded that the Mississippi River could change its course to the Atchafalaya River by 1990 if it were not controlled, since this alternative path to the Gulf of Mexico through the Atchafalaya River is much shorter and steeper. 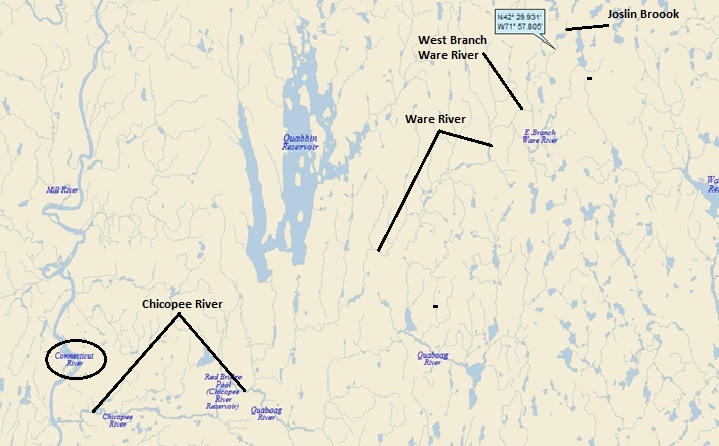 Knowing that this process would diminish the Mississippi and every city along the river as well as all commerce up and down the river, in 1964 the Army Corps built a control structure that controls the flow of the two rivers (called the Old River Control Structure). 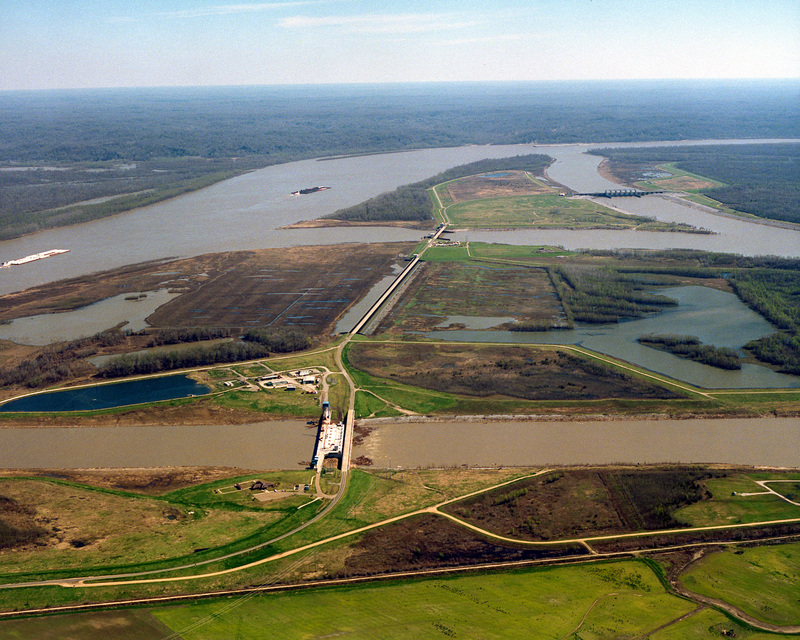 70% of the water flows through the Mississippi, while 30% flows through the Atchafalaya. The Old River Control Structure and both rivers require constant maintenance and upkeep as the Army Corps continues to battle the natural forces at work. A flood in 1973 nearly destroyed the structure; the Atchafalaya was perilously close to receiving the entire flow of the Mississippi. 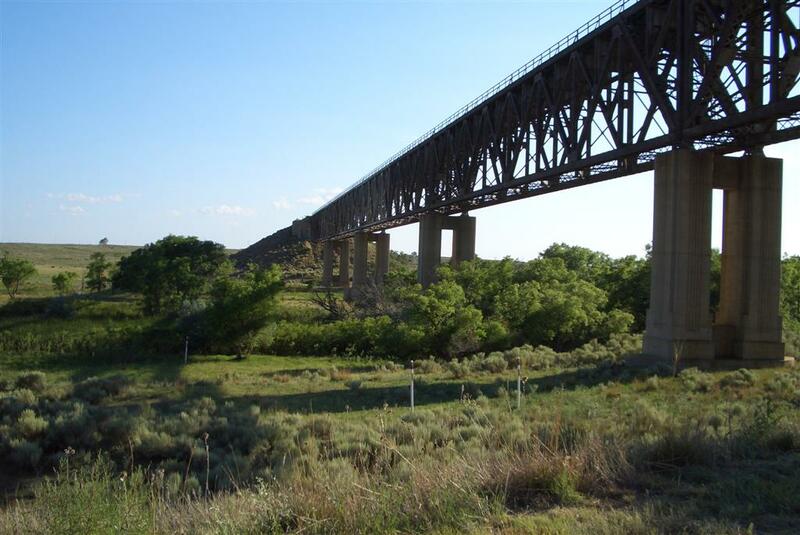 The structure was repaired and additional improvements made in 1986. 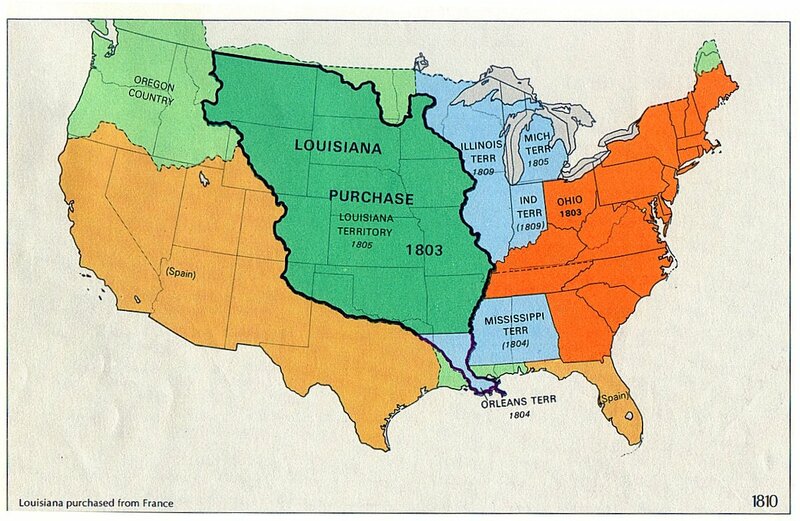 If it weren’t for the Old River Control Structure, the Mississippi River as we know it would not exist. New Orleans and Baton Rouge would lose their geographic significance and source of income, and thousands of American businesses would have to overhaul their practices. They should’ve gotten the dog to turn around . . .